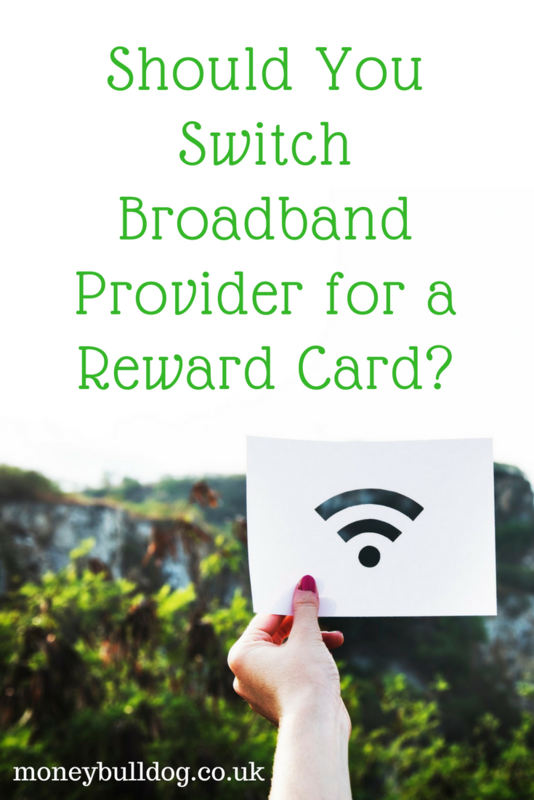 Should You Switch Broadband Provider for a Reward Card? For many people, life without broadband in the home is now simply unimaginable. The problem is that getting broadband with adequate speeds and reliability can also be expensive! This means that many people are forced to hunt around for the best broadband deals every 12-18 months as their contract expires. The good thing about switching is that there are often great deals to be found. The bad thing is that you don’t always know what quality of service some broadband providers will offer. For instance, at the time of writing if you look on the BT website* you will see that they have some great reward card deals available for new customers. With these deals you can get a prepaid Mastercard worth up to £120 if you switch your broadband over to BT. You can also get a prepaid Mastercard with certain Sky TV or Broadband packages* and Virgin Media are currently offering up to £150 of bill credit if you switch to them. Great, right? Well, while we’re all for getting freebies and saving money on this blog, it’s sometimes good to pause and think before making a big decision. This is especially true when it’s a decision that you may have to live with for the next 18 months or so. The question we’re asking today, then, is whether it’s worth switching your broadband just to get a reward card? Here are some important points to consider before you make your decision. The reason I’m writing this post is because my broadband contract is currently up for renewal. I’ve been with BT for some time now and after a few bad experiences with other broadband providers previously, I can honestly say that I am really happy with the service I’ve had from BT Broadband*. This includes the customer service offered when I’ve had a problem that needed sorting out. Having said this, the deals I’m currently being offered to renew my contract aren’t the best. As a result, I’ve been shopping around again to see what TV and broadband deals are out there and there are some good offers available. One of the main questions people need to ask themselves, then, is whether it’s worth switching broadband provider simply for a short-term financial reward. Or, are you better off sticking with your current provider if you’ve found their service to be stable and reliable and all of their equipment – such as routers and set top boxes – are working well? There really is nothing more frustrating than getting stuck with dodgy broadband and a router that doesn’t give adequate coverage around your home! Have You Spoken to the Retentions Team? If you are happy with your current broadband provider and you’re only really wanting to switch because you’re not being offered a good enough deal to renew, then maybe it’s worth pushing a little harder for a better deal before making a switch to a new provider. In my experience, you only really get offered the best deals from your current provider once they know that you are serious about leaving. It’s amazing how the ‘very best deal’ you were being offered before seems to get an awful lot better once you actually hand in your notice and cancel. You also seem to get offered better deals as your contract gets closer to its termination date. If you don’t seem to be getting anywhere when you first phone up, it’s worth asking if there is another team that you can speak to, a team with more authority to offer you a better deal. These are often named customer retention teams or something similar. Quite often the person you speak to when you first ring up to discuss your renewal only has certain deals that they are able to offer you. These deals are limited to what’s on the screen in front of them. If you can speak to a member of a customer retentions department, however, then they may be able to offer you a much better deal. Short-term Gain for Long-term Pain? So, before you go out and switch your broadband it may be worth just pausing for a moment and thinking about whether it’s really worth making the switch. Sure, it’s great to have a reward card in hand to go out and spend, but could it be a case of short-term gain for long-term pain? If you end up with dodgy broadband from a poor service provider then this could well turn out to be the case. Still, we understand that nobody likes to be taken for a ride by their existing provider either, so perhaps switching may be the right thing to do in your case. Hopefully this post will have helped you to weigh up the potential pros and cons of switching your broadband to make the right decision for you. Update – After some hard negotiation I decided not to switch and have agreed a new deal with BT*. I’m keeping the same services as I had previously with some slight upgrades and best of all, I’m paying less money. I hope things work out as well for you!